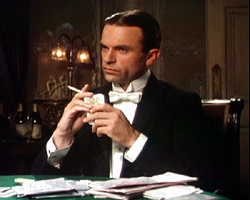 Sam Neill portraying Sidney Reilly in the television mini-series, Reilly, Ace of Spies (1983). The mini series was written by Troy Kennedy Martin, and based on the 1967 book Ace of Spies by Robin Bruce Lockhart, whose father R. H. Bruce Lockhart was one of Reilly's fellow spies. Sam Neill stars as the eponymous character. The theme music is the romance movement from Dmitri Shostakovich’s The Gadfly Suite, though Shostakovitch is not actually credited (Harry Rabinowitz is credited with the music). There are twelve episodes, each approximately 50 minutes in length (the first episode is near 80 minutes). 1901: Professor Sydney Rosenblum is taken from a train and held under unofficial arrest in a provincial Russian village, suspected of stealing confidential oil surveys. The young wife of an elderly vicar may hold the secret to his escape. 1904: Reilly is stationed in Port Arthur and forced to help the Japanese, against his better judgement, in taking the port from the Russians. As a mass evacuation gets under way, Reilly’s plans are put at risk by a soft-spoken detective. 1905: A British operation to steal German ship plans is in danger of being uncovered. Zaharov wants the plans and Cummings wants a compromised agent saved, but Reilly decides on a unique approach to the problem. 1906: Reilly’s search for Margaret takes him to Paris, where Cummings forces him into helping secure an oil contract from an Australian who may sell to the Rothschilds. An unexpected turn of events reunites Reilly with his sister. 1910: Apparently now working for the Germans in Russia, Reilly is to bid on their behalf for a valuable weapons contract, giving him a chance to finally get his revenge on Zaharov. 1910: Reilly’s winning of the weapons contract depends on his marriage to a Russian Countess. Unfortunately, Margaret’s reappearance, engineered by Zaharov, threatens to ruin everything. 1918: Back in Russia, Reilly is tasked with appealing with the Bolsheviks to end their peace treaty with Germany and return to the war. When Lenin refuses, he sets in motion a plan to overthrow the government and place himself in power. 1918: Reilly’s plans come under strain when the British fail to give Savinkov the promised military support and Dzerzhinsky scuppers plans to assassinate Lenin. But then unexpected events change everything. 1918: Reilly and his friends filter back to Britain and face questioning from an official enquiry. As Lenin's condition becomes stable, both Reilly and Dzerzhinsky plan their next moves. 1924: Reilly is in exile in New York drumming up support and money for Savinkov’s anti-bolshevik movement. A new organisation, the Trust, campaigns for Savinkov’s return, but Reilly suspects that Dzerzhinsky is behind them. 1925: Reilly’s propaganda war against the Trust has gone well enough for them to reach out and invite him to Russia. He hopes to finally undermine Dzerzhinsky’s operation, but Dzerzhinsky is already under scrutiny from Stalin. 1925: Reilly has been arrested and is subjected to interrogation and torture. Back in Britain, Pepita fights to find out the truth while Cummings campaigns for his release. As Dzerzhinsky’s whole operation is put under threat, a last minute deal is attempted. The series was issued on DVD by A&E Home Video on 22 February 2005. ^ "1984 Television Craft Film Editor | BAFTA Awards". awards.bafta.org. Retrieved 30 January 2019. Reilly: Ace of Spies on IMDb .